Once in Delhi, you will be picked by our tour representative and will be transferred to the hotel. Relax and prepare for all the fun that you will be having ahead. We will make this day memorable for you as you get to enjoy the amazing history and vivid culture of Delhi. The full day will be constructively spent sightseeing Laxmi Narayan Temple, Parliament House, India Gate, Red Fort, Jama Masjid, Humayun’s Tomb, Gandhi Memorial and Qutab Minar complex. You will be back at the hotel by the dinner time. We are sure you will sleep with a smile on your face reminiscing the beautiful day that you have spent. On the third day, you will leave by road for Agra. 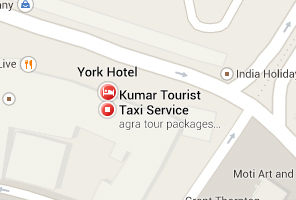 The first thing that we will do on reaching Agra is checking into the hotel. Thereafter, you will enjoy the sightseeing tour of Agra which will cover Agra Fort, Itmad-Ud-Daulah and Taj Mahal. The sunset at Taj Mahal is one of the most magnificent sights that you will ever witness in your life. In the morning, we will leave for Jaipur by road. On the way, we will explore the abandoned Mughal town, Fatehpursikri. The town consists of attractions like Jama Masjid, Jodha Bai, Birbal Bhawan, Panch Mahal and the Buland Darwaza. After exploring the vicinities of Agra, let us head towards our next destination in the trip- Jaipur. After reaching Jaipur, check into the hotel and have a peaceful sleep. In the morning, you will visit the Amber Fort. The fun will be heightened by visiting the royal palace more royally. You will be taken to the fort on an elephant. In the afternoon, enjoy the roadtrip to the city of Jaipur city while covering the other attractions like the City Palace which was once a palace but is now converted to a museum that houses some precious artefacts and traditional items. Next, you will visit the Jantar Mantar which is an astronomical observatory and helps understand the movements of sun, moon and stars. After that, you will be taken to Hawa Mahal and the local bazaars. Overnight stay at the hotel. Early morning after breakfast, you will leave for your next destination, Bikaner. Once in Bikaner, you will check into the hotel. You have the rest of the day at your leisure. After the breakfast, you will visit the various tourist places in Bikaner. At first, you will visit Junagarh. This was fort was built by Rao Bika in 1478. This is the first fort in Rajasthan which is not built on a hill top. Next, you will visit Lal Garh Palace. This palace is built mainly in Indo-Saracenic style. Then you will visit Ganga Golden Jubilee Museum. It is the best museum of Rajasthan. It was established in 1937 on the occasion of Golden Jubilee celebrations of Maharaja Ganga Singh. This museum comprises some of the most unique and amazing collections of artwork, history and sculptures. Later in the evening, you can have fun while shopping. You can buy some amazing stuff like rangeen dupatta, mojari, wooden antiques, kundan work, colorful carpets and many other fascinating things. Later, you can enjoy dinner at a local restaurant. After an early morning breakfast, you will drive next to Jaisalmer. On your way, you will visit the very ancient Karni Mata Mandir. This temple is 600 years old and is also the Gajner wildlife sanctuary. After reaching Jaisalmer, you will check into the hotel. After breakfast, you will commence your sightseeing tour of Jaisalmer. You will enjoy a glimpse of the Gadi Sagar Lake. It was a rain water reservoir for the city, initially. You will visit Jaisalmer Fort. This fort is a world heritage site. It was built by the Rajput ruler, Rawal Jaisal. It is located in the heart of the city. Next you will visit, Patwon ki Haveli. It was built on the orders of Guman Chand Patwa. It is a treat to the eyes because of its excellent mirror work and beautiful paintings. After this, you will be driven to Sam sand dunes to enjoy camel rides and traditional folk dance. Overnight stay in a tent in Jaisalmer. After breakfast, you will leave for Jodhpur. Once in Jodhpur, you will check into the hotel. Relax. In the evening, you visit the ever famous Mehrangarh fort. This fort was built by Rao Jodha. It has several palaces which are famous for their intricate carvings and expansive courtyards. There is also a museum in the fort that has rich historical items like royal palanquins, costumes, paintings and many other things. Later in the night, you can enjoy your dinner at a local restaurant. In the morning, after the breakfast you will visit the Umaid Bhawan Palace. Some part of this palace has been converted into a private hotel owned by the Taj Group of Hotels. You will enjoy the grandeur of the Rathore dynasty. The next spot will be Jaswant Thada. It is a cenotaph. It was built by Maharaja Sardar Singh in the memory of his father, Maharaja Jaswant Singh II. After lunch, you will leave for Kumbhalgarh. After the breakfast, you will ahead towards the very magnificent Kumbhalgarh fort and the Kumbhalgarh National Park. The fort was built by Maharaja Rana Kumbha. The fort is encircled by 13 mountain peaks and is situated on the top most of the ridges. It has magnificent temples, palaces, and gardens. The Kumbhalgarh National Park is home to a very large variety of wildlife. It includes wolf, leopards, sloth bear, hyena, jungle cat, chinkara, and many more. There are some fantastic bird species as well. Like red spur owls, parakeets, golden oriole, grey pigeons, dove and some others. In the evening, you will leave for Udaipur. Check into the hotel. Overnight stay in Udaipur. After the breakfast, you will explore the “City of Lakes”. You will visit Jagdish temple, City Palace, Saheliyon-ki-bari, Fateh Sagar lake, Sajjan Garh, and Eklingji Temple. This lake has amazing hustle-bustle in the evening. Enjoy the roadside food. Enjoy the breakfast and then proceed towards the Udaipur airport. Board flight for Delhi/Mumbai. On arrival, you will dropped at the Delhi/Mumbai airport or your home.